AUGUSTA, Ga. — Three days before teeing off to start his sixth Masters, Jordan Spieth was hanging out in his rental house waiting for Virginia-Texas Tech to tip off. The Golf Channel was replaying his monumental runaway 2015 win, and Spieth took the chance to relive the finest moments of his pro career. “It was the highest of highs I’ve had in this sport,” Spieth said Tuesday. It’s now Thursday; Jordan Spieth is hacking away at Augusta like he’s trying to carve through a bamboo forest; and man, 2015 seems like a long time ago. On an afternoon when the leaders carved up Augusta National like a wedding cake, Spieth floundered. While his playing partner Brooks Koepka took charge of the tournament, finishing tied for first with Bryson DeChambeau at 6-under, Spieth stumbled and staggered, ending nine strokes back at 3-over. But there’s an element of pleading in the cheers, fans — patrons, in the case of Augusta National — all too aware of the way that Spieth’s career has hit a sandbar. You’ll hear “Let’s go Jordan!” and “Come on Jordan!” and “Hook ‘em!” (a nod to Spieth’s Texas lineage) every hole he plays. And when the cheers veer close to pity, it’s got to be frustrating as hell. Spieth spends half his time on the golf course talking to his ball — pleading, cajoling, encouraging, his face wavering between disappointment and dejection. “Come on,” he called out after his tee shot on 17, “work with me, ball!” The ball — which these days is about as obedient as a new puppy — didn’t listen to him, ending up behind a small stand of pines. Here’s the worst part: stats suggest that this might be as good as it gets for Spieth this week. His scores drop off a cliff once the weekend rolls around; his scoring averages go from 16th and 14th on Tour for Thursday and Friday, respectively, to 205th and 208th. Much of that falloff has to do with Spieth’s putting; he goes from one of the best putters in the game during the week (ranking third on Thursdays, second on Fridays) to one of the absolute worst (186th on Saturdays, 127th on Sundays). It’s all part of a run that’s gone from sequence to pattern. Spieth hasn’t won a tournament anywhere on earth since knocking off Matt Kuchar in 2017 at the Open Championship. He’s plummeted to 33rd in the world golf rankings. He’s made the cut at only 7 of 10 events this season, and hasn’t placed any higher than T30 in a stroke-play event. Which brings us to Thursday. 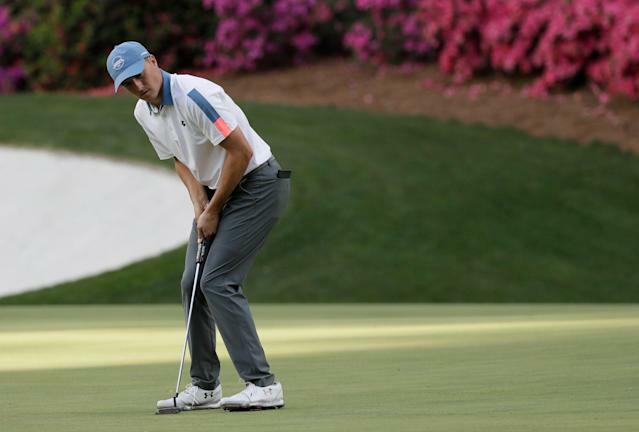 The leaders were dropping strokes on the back nine like Steph Curry burying threes — DeChambeau and Mickelson lopped five strokes off their cards in just seven holes, Koepka five over nine holes — Spieth could only manage a single birdie over the final 10 holes. Clearly it wasn’t the round he wanted — the usually media-friendly Spieth declined to talk about his round afterward. Spieth and Koepka created an unintentional metaphor as they walked up the 18th fairway together. They were side by side, matching stride for stride, until Spieth stopped 288 yards from the tee. Koepka, who’s won three of the last seven majors, kept on walking another 30 yards closer to the pin. Spieth won’t ever be an afterthought at Augusta — the green jacket takes care of that — but the spotlight’s shining a lot brighter on other players right now. Maybe so. Just not yet.